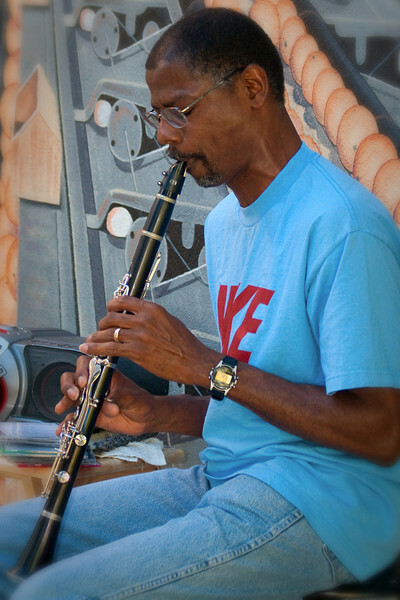 Raymond Pitts a local artist played his clarinet at the Wildflower Cafe this evening. It was cool, smooth Jazz which made for a nice relaxing evening. (I almost forgot it was still 96 at 7:30 pm) Raymond is sitting in front of one of our first murals in Exeter which made a great backdrop for his performance. I used my 350EX flash for the first time in a long time and I think it helped fill in the shadows. Awesome job Denise!! The flash definitely helped the lighting - very nice and even!!! Yahoo! !